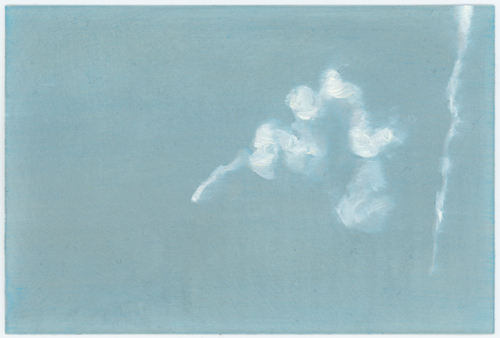 Benjamin Cottam, Blue Sky 1, 2012, oil on aluminum, 4 x 6”. Benjamin Cottam’s new paintings walk a fine, elegant line between optical pleasure and cerebral provocation. Composed on small, thin rectangular slices of aluminum, the gossamer whimsy of his “Blue Skies” series, 2011–12, evinces a freewheeling serenity. Set against a slate-blue background, white wisps and clots conjure up, at first sight, John Constable’s cloud studies, which were famously painted in direct observation of nature’s fleeting contingencies. The parabolas of white paint smeared across these surfaces, however, are derived from a reality that is anything but organic. Based on photographs of tear gas fired by police at demonstrators, Cottam’s images conceal an unspoken and more chilling etiology. The gestural freedom entailed in these works’ creation––each composed in one sitting––stands at ironic odds with the liberation of perception, invoking instead a violent assault on the body and its senses. More vivid in their throbbing, cherry-red monochrome, and composed of oil on copper, Cottam’s “Red Paintings,” 2012, harbor their own secrets, less conceptual than visual. Each work contains a portrait, barely visible on––or in––its glossy, burnished surface. These frontal likenesses––featuring the artist himself as well as individuals close to him––court associations from holograms to the Shroud of Turin. But rather than being gimmicky, they come off somewhere between playful and haunting. Photographic reproduction of these works––online and elsewhere––fails to capture their subtly limned physiognomies, requiring a certain perceptive patience, similar to that required by an Ad Reinhardt canvas from the late 1950s or ’60s. Set in the arresting, cavernous space of Gasser and Grunert’s elegant concrete gallery, the paintings repay the close attention they humbly expect.